which will be used to pay fees for every operation on the site. investment in token events and support user-launched token sales. has announced its ICO, starting May 8, 2018. 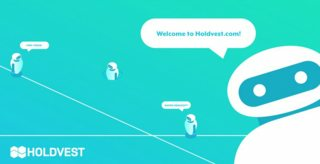 Have you heard about Holdvest? Keep reading to find out more! to ensure swift and smooth development of their software post-token sale. and we’ve decided to close the round in three days and introduce it as our successful seed round. Pre-ICO ends in 2 days....Don't miss out! Holdvest Pre-ICO closes in 1 day!! !